If you paid via credit card, debit card, gift card or check, the store can track your purchase and refund the full amount without a receipt. The store’s return window is 90 days for unopened, undamaged items with a receipt. A couple of exceptions: consumer electronics, which have a 30-day return window, and Target-brand items, which have a 365-day return window. Most store and Target.com items can be exchanged in store within the return policy time frame. You can also return purchases via our online return center and place a new order. To start your online return, visit the find your order page. Locate the item within your order history and select return next to the item. Follow the prompts to complete your return. Need help? Call Target.com Guest Services at 1-800-591-3869. We can attempt to look up the receipt for your purchase. 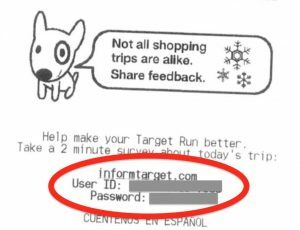 Bring the item, a government-issued photo ID (such as a driver’s license) and the method of payment used to Guest Services within the return window allowed for that item (see Target Return Policy). Target even offers shoppers a generous “gift” during holiday time. For holiday electronic purchases bought Nov. 1-Dec. 25, that 30-day clock doesn’t start until Dec. 26. Did you know you can take a short survey and get a chance to win a shopping spree? All it takes is taking a 2 minute survey about your trip to a store. Give them valuable feedback to improve the great services at Target.